Religioscope – Without being acquainted with you, it seems obvious that you are a person fascinated by time and geography: beside MacQibla, you have produced Time Palette – which displays the current local time for any city along with many other features – as well as EarthDesk – which replaces one’s static desktop picture with a real-time rendered image of the earth. Where does this fascination come from? Trygve H. Inda – Both my parents worked for a major international airline, so I became interested in travel at an early age. In my time, I have been fortunate enough to have traveled quite extensively and came to experience first-hand how interconnected the world really is. Time and geography are inseparable. Once I started working on Time Palette, it sort of just snowballed with new ideas coming to me faster than I could implement them. In some cases, the computers of the time were not powerful enough to do what I wanted, so these features would have to wait. 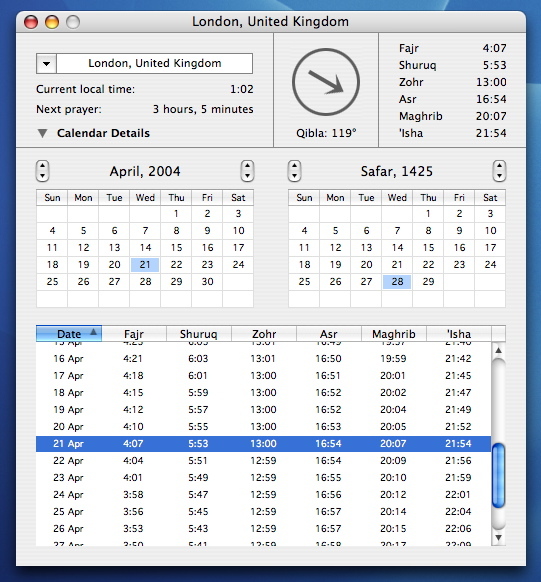 Religioscope – Creating software such as MacQibla also suggests a strong interest for and good knowledge of the world of Islam. Trygve H. Inda – I was not raised Muslim, but became interested in the Middle East and Islam during the late 1980s and was able to make my first trip to the region (to the UAE and Bahrain) in 1993. At that point, I fell in love with the Islamic world and made several return trips as time and money allowed. This of course led to further study of Islam and the Arabic language. Religioscope – How did the idea of creating MacQibla come to you? How long has MacQibla been available? Trygve H. Inda – In the late 90s, the Mac platform lacked a good prayer time calculator and since most of the underlying algorithms and city database had already been developed in early versions of Time Palette, it was a rather obvious next step. I had been playing with the idea for a few years but wasn’t able to release it until 1998. It was not a profitable product, considering the investment, but was well-received by the Muslim Mac community. Religioscope – In order to understand better the technological and practical challenges involved in the creation of MacQibla, it might be useful to remind us about the principles of prayer time calculation in Islam. Trygve H. Inda – In short, the times of the five daily prayers are based on the movement of the sun across the sky. These occur at dawn, midday, afternoon, sunset and dusk. Of course there are stricter definitions which the software has to take into account (such as what constitutes ‘dusk’), but this is the general idea. One big problem immediately comes to mind… in places that are close to the poles (Scandinavia for example), the sun may not rise or set for long periods, or dusk may never fully occur. In recent times, calculation of prayer times at high latitudes has become more necessary since global migration has resulted in many Muslim people living in these regions. Islamic scholars, researchers and astronomers have of course thought about these issues and have come up with ways to determine the proper times for Muslims to pray. These methods are necessarily more complex than those of lower latitudes, but it is something that MacQibla had to support. Religioscope – Can MacQibla be used by Muslims from any school of Islam, or are there some calculation differences which you were not able to take into consideration in the software? Trygve H. Inda – While nothing has been intentionally omitted and MacQibla makes every effort to be quite versatile in this regard, it probably does not allow for every conceivable method used by every school of Islam. To date, nobody has requested such, but I would be happy to hear from people who require slightly different settings for the calculations. I am always looking for ways to make all three products better. Religioscope –MacQibla offers an extensive range of services: not only prayer times for any date and location, database of 10,000 cities included, but also export of monthly prayer tables, handling of conditions at high latitudes, direction of Mecca from any city in the world, and other features… It must have been a work of several months to produce such a tool? Trygve H. Inda – Most people don’t realize the effort that goes into creating a piece of software, and yes, MacQibla represents several months’ work. Fortunately, because Time Palette, EarthDesk and MacQibla all share a few common elements (and time as a common theme), some of the code used in one program can be adapted to the others. However some code is unique to MacQibla and had to be developed from scratch. This would include conversion between the Western and Islamic calendar system and certainly the calculation of prayer times. Religioscope – What have been the major improvements throughout the different versions of MacQibla? Trygve H. Inda – MacQibla 3.0 is such a major leap forward for the product that it is hard to compare it to the previous release. I would have to say the most noticeable improvements are the ability to play an audio file of the call to prayer and better support for places at high latitudes. Especially for those users who are living in non-Muslim countries, I envision many people leaving MacQibla running all the time so the call to prayer will be as common as if they were in Turkey or Pakistan. Religioscope – Macintosh users are a relatively small community compared with Windows users. Is there a market for Mac products in traditionally Muslim countries? Where? Trygve H. Inda – I think so. In the case of MacQibla, people have been waiting for a Mac OS X version for a long time, so it is something I really wanted to do. Even if it doesn’t make much business sense, there is a need for such a tool. (although I am optimistic about this), but the market is growing. Muslim Mac markets have been Turkey, Saudi Arabia, the UAE and Malaysia. Religioscope – By the way, are similar products available for Windows users? Trygve H. Inda – I haven’t investigated this in any meaningful way. My market is Mac users and I really don’t see the Windows market as competition since few people will make their computer purchase decision on the basis of prayer time software. Religioscope – From customers’ reports, who buys MacQibla? Trygve H. Inda – I would have to say the market is too small to give a good indication. There is about a 50/50 split between sales in traditionally Muslim countries and the US/Europe. Most people have been happy to finally have access to such a tool on Mac OS X.